Chrome 68 is being rolled out as we speak and for PWA lovers like yourself, the biggest noticeable change would be the switch from the Add to Home Screen banner to the mini-infobar. Here is the old A2HS banner and the new mini-infobar, side by side. Its cleaner, less obstructive and does the job well. 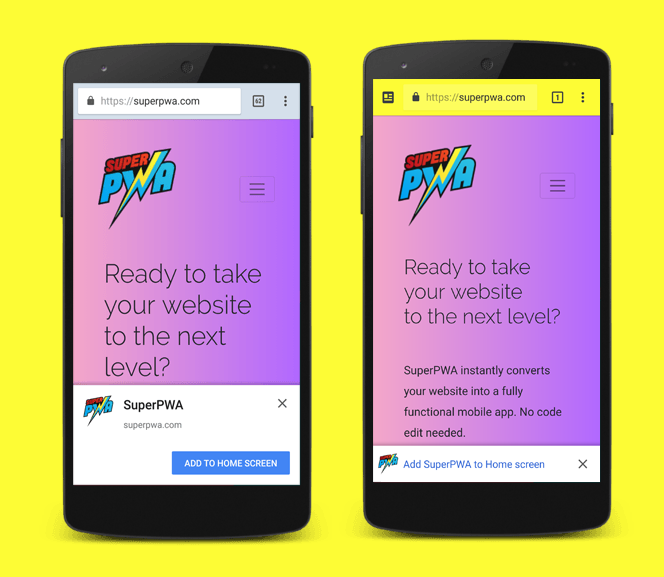 SuperPWA 1.9 is tested on Chrome 68 and its all good! As you know, in SuperPWA you can set an Offline Page from the settings and this page will be displayed to the user if the user is offline and the requested page is not available in the offline cache. Until now, only the offline page content was cached during service worker installation, but starting with this release, you can add images to the offline page and SuperPWA will cache them for offline use. Note: If the offline page is already set and you just added an image, please remember to regenerate the service worker (by deactivating and reactivating SuperPWA). We have had some translation contributions since the last update. The most notable ones are the French translation from @romainvincent and the Spanish translation from @arkangel. Portuguese, Italian, Malayalam and few other translations are in progress as well. It is exciting and humbling to see community contributions and we are super thankful to these contributions. If you want to see SuperPWA in your language, you can contribute easily at translate.wordpress.org. There are few other code improvements that will make SuperPWA better for everyone. You can find the changelog here. Please leave a comment or contact us to give us your feedback on this update or anything else in general. See you with another update soon!